My final postcard for this trip and my 400th post. 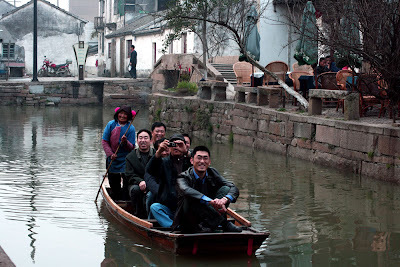 Tongli a small canal town about 2 hours from Shanghai by car. Unless with our driver. The nail biting trip saw us there in 55mins. This picturesque town rose to fame in the mid 80's when Chinese film makers discovered it. One of the most famous films in which it featured was The Dream of the Red Chamber. Ten minutes earlier this laughing group of tourists taking my photo were a nervous unsteady group clambering into the canal boat nearly tipping out as their guide organised and reorganised where they were to sit in the boat. Nice joyful shot ! happy 400th post ! I love the prominence of canals in this area! It's so gorgeous. So nice, as usual! Happy 400th post!Ciao. A.
excellent photo and congratulations on your 400th post. that is an accomplishment.